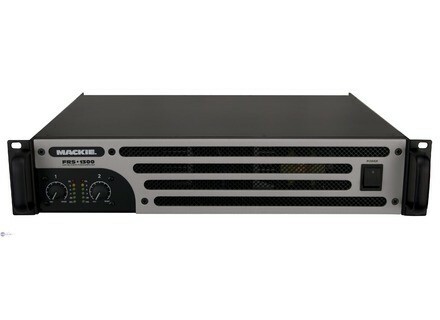 FRS 1300, Dual-Channel Power Amp from Mackie in the FRS series. ecce48's review (This content has been automatically translated from French)" quite correct"
Two years ago I use it occasionally as a complement rather than 3 QSC. I basically concur with the previous opinion except that I paid much more expensive. However, I notice a big difference in power between a use 8ohms and 4 ohms. power seems to be almost doubled from 4 to 8. It It also supports 2 ohms but I see no difference in power compared to 4 ohms. Test 2 ohms for 8 hours, it fits perfectly without flinching, it heats up just a little more but the fans are working. So it into 4 ohms it will give the best of himself with a good constant power, well-rounded bass, excellent midrange, and treble suffisamments clear. Good versatile amp but I think at the price which I paid (499 €), you can do better but it's still quality Mackie, very correct and sound. This amp is no longer in the catalog and I think it's a good choice occasion. Higher power drawn from 2x235 w EXCELLENT.